HANOI (Reuters) - U.S. President Donald Trump and North Korean leader Kim Jong Un begin their second summit in less than a year in the Vietnamese capital on Wednesday, with the U.S. side seeking tangible steps by North Korea to dismantle its nuclear weapons program. The White House said Trump would meet Kim at Hanoi's French-colonial-era Metropole Hotel at 6:30 p.m. (1130 GMT) and have a 20-minute one-on-one conversation before a dinner scheduled to last just over an hour and a half. Trump flew into Hanoi on Air Force One late on Tuesday. "Just arrived in Vietnam," he wrote in a Twitter post. "Thank you to all of the people for the great reception in Hanoi. Tremendous crowds, and so much love!" Kim arrived by train early in the day after a three-day, 3,000-km (1,850-mile) trip from his capital, Pyongyang, through China. He completed the last stretch from a border station to Hanoi by car. The two leaders, who seemed to strike up a surprisingly warm relationship at their first summit in Singapore last June, will be accompanied at dinner by two aides and interpreters, the White House said, before they meet again on Thursday. While much of that first meeting was about breaking the ice after decades of bitter animosity between their two countries, this time there will be pressure to move beyond a vaguely worded commitment by Kim to work toward the complete denuclearization of the Korean peninsula. Trump's critics at home have warned him against cutting a deal that would do little to curb North Korea's nuclear ambitions, urging specific, verifiable North Korean action to abandon the nuclear weapons that threaten the United States. 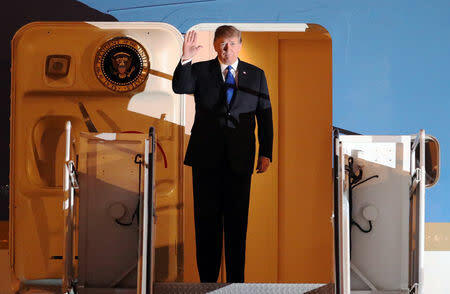 Trump, landing in darkness, waved as he disembarked Air Force One and was met by senior Vietnamese and U.S. officials. His motorcade passed crowds waving the flags of Vietnam, the United States and North Korea on its way to the JW Marriott Hotel, his accommodation for the two-day summit. Earlier, Vietnamese officials greeted Kim at the station in Dong Dang town after he crossed the border from China by train. He got a red-carpet welcome with honor guard, military band and fluttering North Korean and Vietnamese flags. Kim was accompanied by his sister, Kim Yo Jong, an important aide. About a dozen bodyguards briefly ran alongside his limousine as he began the two-hour journey to Hanoi. Roads were closed with security forces in armored personnel carriers guarding the route to the Melia hotel, where Kim is staying. At the Melia hotel, Kim "heard concrete details on the pattern of engagement between working-level delegations," KCNA said, referring to the North by its official name, the Democratic People's Republic of Korea. Visiting the North Korean embassy in Vietnam, Kim urged staff there to strengthen two-way ties in line with the needs of the times, KCNA added. Kim "will reunite with U.S. President Donald J. Trump from February 27 to 28 and conduct the historic second DPRK-U.S. summit," before embarking on a goodwill visit to Vietnam on March 1 and 2, the agency said. Trump said before leaving Washington it would be "a very tremendous summit" and stressed the benefits to North Korea if it gave up its nuclear weapons. "With complete denuclearization, North Korea will rapidly become an economic powerhouse," he said. "Without it, just more of the same. Chairman Kim will make a wise decision!" In a speech on Sunday, however, Trump appeared to play down the possibility of a major breakthrough, saying he would be happy as long as North Korea maintained its pause on weapons testing. "I'm not in a rush," he said. "I just don't want testing. As long as there's no testing, we're happy." North Korea has not held a nuclear or missile test since 2017, but analysts say the two leaders have to move beyond summit symbolism. "The most basic, yet urgent, task is to come to a shared understanding of what denuclearization would entail," said Gi-Wook Shin, director of Stanford’s Asia-Pacific Research Center. "The ambiguity and obscurity of the term 'denuclearization' only exacerbates the skepticism about both the U.S. and North Korean commitments to denuclearization." While the United States is demanding North Korea give up all of its nuclear and missile programs, the North wants to see the removal of a U.S. nuclear umbrella for South Korea. Trump's departure from Washington comes at a time of increased pressure at home, and he is keen to show progress on a foreign policy issue that has confounded multiple predecessors. Some analysts fear that may lead him to pull his punches. "The main concern is whether the president, besieged by domestic distractions, will give away too much, and take a bad deal that leaves the United States less secure," said Victor Cha, a former White House official who took part in North Korea talks under previous Republican administrations. While Trump is in Hanoi, his former personal lawyer Michael Cohen is testifying before U.S. congressional committees, with the president's business practices the main focus. Anticipation has also been rising about the impending release of Special Counsel Robert Mueller's report on Russian interference in the 2016 U.S. election, though a senior U.S. Justice Department official said on Friday it would not come this week. A South Korean presidential spokesman told reporters in Seoul the two sides might be able to agree to a formal end of the Korean War, a move long sought by North Korea, as the war concluded with an armistice, rather than a peace treaty.